Just discovered Novica, and I couldn't be happier with my purchases. Quality materials, quality metal work and a beautiful end product. I wore these to work today and got so many compliments! These earrings are just really cute and fun! In my opinion, they can be dressed up or down. They?re very versatile and very unique. Very high quality earrings. They are stunning. The picture is very accurate. I loved the Artist statement which made me want to purchase it more. "Our motifs are Balinese and include jawan (silver bubbles) and bun (swirls). These motifs are challenging because they require a delicate hand for an intricate process." "I'm Made Sugi and I was born in Bali in 1975 as the second of four children. My hometown has a lot of jewelry artisans working with silver who have inspired me. "After finishing my education, I got married and had two daughters and two sons. My children made me more responsible and active. I feel blessed to have this life and a healthy family. "I helped with my husband's silver workshop and then began designing. I enjoy this art and have learned a lot. My husband and neighbors taught me how to craft jewelry. In the beginning, I cleaned, melted and shaped silver, until I was finally able to craft my own designs. "Once, I had to help clean many silver pieces and sprained my finger and was unable to use it until now. My motto is never to give up, keep working and increase productivity. "We use silver, gemstones and pearls. We are helped by 15 jewelry artisans who use traditional tools. Our motifs are Balinese and include jawan (silver bubbles) and bun (swirls). These motifs are challenging because they require a delicate hand for an intricate process. "In designing, I'm inspired by our culture and tradition. This makes our creations different from that of other countries and even jewelry from other regions in Indonesia. We hope people around the world like our jewelry so that Bali's silversmiths can continue this craft and also earn a living." Sterling Silver Cultured Pearl Chandelier Earrings Indonesia, "Moonlit Orbs"
Cultured Pearl Filigree Chandelier Earrings from Peru, "Beautiful Gala"
24k Gold Plated Cultured Pearl Filigree Chandelier Earrings, "Artisanal Gala"
By Peruvian artisan Alfredo Inga, these chandelier earrings feature intricate filigree work crafted of 24k gold plated sterling silver. 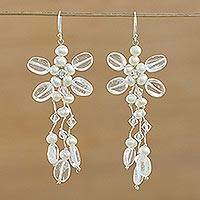 Petite cultured pearls dangle within and below each earring. 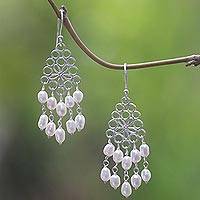 The luminous and fantasy like nature of our unique pearl chandelier earrings makes them desirous to all. 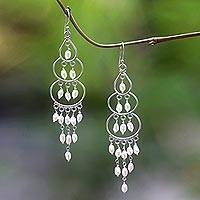 The first appearance of a chandelier earring dates back to 2500BC. However, this style did not become popular until Richard Graziano featured the earring in Vogue in its November 1999 issue. Ever since, this style has taken off. 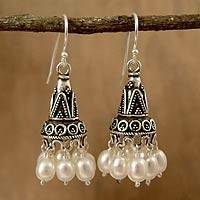 The artisans of Novica have put together a unique collection of earrings by pairing the fashionable chandelier style with pearls. History shows that the pearl served as a symbol of wealth, power, purity, and femininity. In Europe, only royalty and the very wealthy were allowed to wear pearl jewelry. This elegant gem was much adored by Julius Caesar, and Cleopatra’s sacrifice of a pearl was made to declare her love for Marc Antonius. 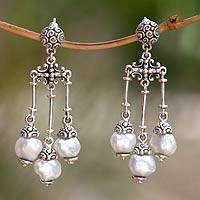 In the ancient Inca and Aztec civilizations pearls were believed to have magical powers. 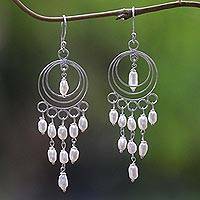 Thanks to the artisans featured on NOVICA you can now own a pair of extraordinary and stylish pearl chandelier earrings. You can adorn yourself in pearls that make you feel like royalty. 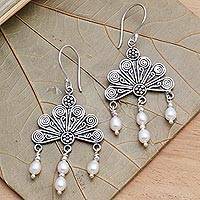 And whether you believe, like the Incas and Aztecs, that pearls have magical powers or not, wearing pearl earrings from this exquisite collection will be a magical experience.